Huge Savings Item! Free Shipping Included! 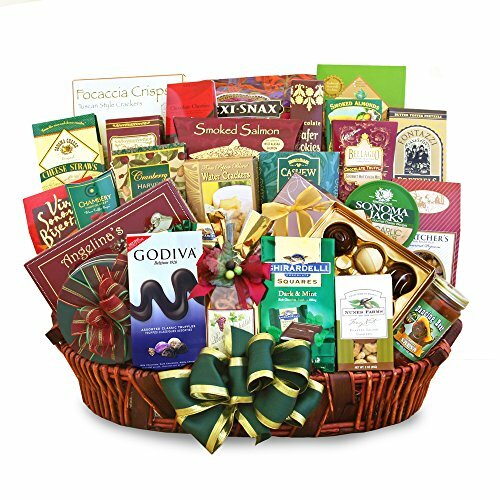 Save 12% on the California Delicious Gourmet Delights Gift Basket by California Delicious at 365 Days Of Kindness. Hurry! Limited time offer. Offer valid only while supplies last. Stupendous in size and hugely satisfying to all who partake, this selection’s lavish proportions are only equaled by its formidable tastiness. Stupendous in size and hugely satisfying to all who partake, this selection’s lavish proportions are only equaled by its formidable tastiness. They’ll delight in white and milk chocolate covered sandwich cookies, Ghirardelli milk and caramel squares, snack mix, Ghirardelli dark and mint squares, nunes farms cashews, salsa, Ghirardelli masterpiece collection chocolate assortment, butter cookies, chocolate dipped biscotti, chocolate truffles, chocolate wafer cookies, cranberry harvest medley, water crackers, cashew Roca, hot cocoa mix, butter toffee pretzels, cheese, chocolate drizzled gourmet popcorn, smoked almonds, tortilla chips, chocolate covered cherries, focaccia crackers and chocolate chip cookies . When you need to make a grand impression this is the selection.